For indigenous communities, place names hold special value. As Délı̨nęgot’ı̨nę elder Morris Neyelle puts it, “I always want my kids to understand the history and be proud of who they are. The names given by our ancestors should be in place rather than the English ones, so that my people can understand where they come from.” Place names are vital as the framework upon which other types of spatially-oriented, ecological, and traditional use information are structured and transmitted between generations. Place names have always been passed on through oral tradition. However, communities in the Northwest Territories have also been recording place names – and the stories and legends attached to them – using alternate and new technologies for more than 150 years. Émile-Fortuné Petitot was a French oblate missionary , and one of many individuals who has worked with knowledgeable indigenous and non-indigenous land-users to record place names during his extensive travels in the Athabasca-Mackenzie area of what is now the Northwest Territories during 1862-1883. Castongay, Rachelle. 1981. La structuration de l'espace telle que revelée par l'analyse du système toponymique des Indiens Peaux-de-Lièvre de Fort Good Hope. Masters thesis. Ottawa : Université d’Ottawa. Savoie, Donat, ed. 2001. 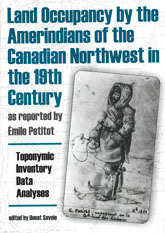 Land Occupancy by the Amerindians of the Canadian Northwest in the Nineteenth Century as Reported by Émile Petitot: Toponymic Inventory, Data Analyses, Legal Implications. Edmonton: Canadian Circumpolar Institute, University of Alberta. Whaèhdǫǫ̀ Nàowoò Kǫ̀ [Traditional Knowledge Research Group]. 2002. Dogrib Knowledge of Place Names, Caribou and Habitat. Report to the West Kitikmeot Slave Study Society, Yellowknife, NWT, prepared by Leslie Saxon, Sally Anne Zoe, Georgina Chocolate, and Allice Legat. Available here.